A simple machine is a device for doing work that has only one part. Simple machines redirect or change the size of forces, allowing people to do work with less muscle effort and greater speed, thus making their work easier. There are six kinds of simple machines: the lever, the pulley, the wheel and axle, the inclined plane, the wedge, and the screw. We all do work in our daily lives and we all use simple machines every day. Work as defined by science is force acting upon an object in order to move it across a distance. So scientifically, whenever we push, pull, or cause something to move by using a force, we are performing work. A machine is basically a tool used to make this work easier, and a simple machine is among the simplest tools we can use. Therefore, from a scientific standpoint, we are doing work when we open a can of paint with a screwdriver, use a spade to pull out weeds, slide boxes down a ramp, or go up and down on a see-saw. In each of these examples we are using a simple machine that allows us to achieve our goal with less muscle effort or in a shorter amount of time. This idea of doing something in a better or easier way or of using less of our own muscle power has always been a goal of humans. Probably from the beginning of human history, anyone who ever had a job to do would eventually look for a way to do it better, quicker, and easier. Most people try to make a physical job easier rather than harder to do. In fact, one of our human predecessors is called Homo habilis, which means "handy man" or "capable man." This early version of our human ancestors was given that name because, although not quite fully human, it had a large enough brain to understand the idea of a tool, as well as hands with fingers and thumbs that were capable of making and using a tool. Therefore, the first simple machine was probably a strong stick (the lever) that our ancestor used to move a heavy object, or perhaps it was a sharp rock (the wedge) used to scrape an animal skin, or something else equally simple but effective. Other early examples might be a rolling log, which is a primitive form of the wheel and axle, and a sloping hill, which is a natural inclined plane. There is evidence throughout all early civilizations that humans used simple machines to satisfy their needs and to modify their environment. Compound machine: A machine consisting of two or more simple machines. Effort force: The force applied to a machine. Fulcrum: The point or support on which a lever turns. Resistance force: The force exerted by a machine. Work: Transfer of energy by a force acting to move matter. The beauty of simple machines is seen in the way they are used as extensions of our own muscles, as well as in how they can redirect or magnify the strength and force of an individual. They do this by increasing the efficiency of our work, as well as by what is called a mechanical advantage. A mechanical advantage occurs when a simple machine takes a small "input" force (our own muscle power) and increases the magnitude of the "output" force. 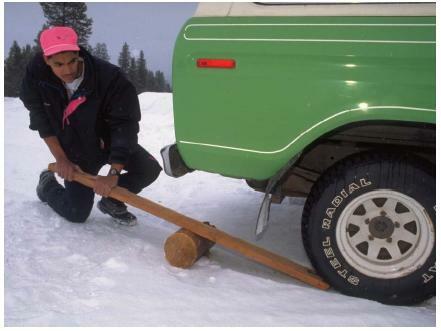 A good example of this is when a person uses a small input force on a jack handle and produces an output force large enough to easily lift one end of an automobile. The efficiency and advantage produced by such a simple device can be amazing, and it was with such simple machines that the rock statues of Easter Island, the stone pillars of Stonehenge, and the Great Pyramids of Egypt were constructed. Some of the known accomplishments of these early users of simple machines are truly amazing. For example, we have evidence that the builders of the pyramids moved limestone blocks weighing between 2 and 70 tons (1.8 and 63.5 metric tons) hundreds of miles, and that they built ramps over 1 mile (1.6 kilometers) long. One of the keys to understanding how a simple machine makes things easier is to realize that the amount of work a machine can do is equal to the force used, multiplied by the distance that the machine moves or lifts the object. In other words, we can multiply the force we are able to exert if we increase the distance. For example, the longer the inclined plane—which is basically a ramp—the smaller the force needed to move an object. Picture having to lift a heavy box straight up off the ground and place it on a high self. If the box is too heavy for us to pick up, we can build a ramp (an inclined plane) and push it up. Common sense tells us that the steeper (or shorter) the ramp, the harder it is to push the object to the top. Yet the longer (and less steep) it is, the easier it is to move the box, little by little. Therefore, if we are not in a hurry (like the pyramid builders), we can take our time and push it slowly up the long ramp to the top of the shelf. Understanding this allows us also to understand that simple machines involve what is called a "trade-off." The trade-off, or the something that is given up in order to get something else, is the increase in distance. So although we have to use less force to move a heavy object up a ramp, we have increased the distance we have to move it (because a ramp is not the shortest distance between two points). Most primitive people were happy to make this trade-off since it often meant being able to move something that they otherwise could not have moved. 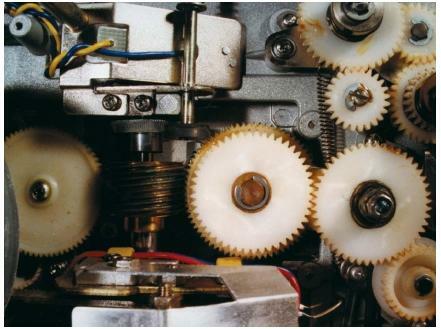 Today, most machines are complicated and use several different elements like ball bearings or gears to do their work. However, when we look at them closely and understand their parts, we usually see that despite their complexity they are basically just two or more simple machines working together. These are called compound machines. Although some people say that there are less than six simple machines (since a wedge can be considered an inclined plane that is moving, or a pulley is a lever that rotates around a fixed point), most authorities agree that there are in fact six types of simple machines. the resistance force. The effort applied by your second hand lies between the resistance force (dirt) and the fulcrum (your first hand). A pulley consists of a grooved wheel that turns freely in a frame called a block through which a rope runs. In some ways, it is a variation of a wheel and axle, but instead of rotating an axle, the wheel rotates a rope or cord. In its simplest form, a pulley's grooved wheel is attached to some immovable object, like a ceiling or a beam. When a person pulls down on one end of the rope, an object at the opposite end is raised. A simple pulley gains nothing in force, speed, or distance. Instead, it only changes the direction of the force, as with a Venetian blind (up or down). Pulley systems can be movable and very complex, using two or more connected pulleys. This permits a heavy load to be lifted with less force, although over a longer distance. The wheel and axle is actually a variation of the lever (since the center of the axle acts as the fulcrum). It may have been used as early as 3000 B.C. , and like the lever, it is a very important simple machine. However, unlike the lever that can be rotated to pry an object loose or push a load along, a wheel and axle can move a load much farther. Since it consists of a large wheel rigidly attached to a small wheel (the axle or the shaft), when one part turns the other also does. Some examples of the wheel and axle are a door knob, a water wheel, an egg beater, and the wheels on a wagon, car, or bicycle. When force is applied to the wheel (thereby turning the axle), force is increased and distance and speed are decreased. When it is applied to the axle (turning the wheel), force is decreased and distance and speed are increased. An inclined plane is simply a sloping surface. It is used to make it easier to move a weight from a lower to a higher spot. It takes much less effort to push a wheel barrow load slowly up a gently sloping ramp than it does to pick it up and lift it to a higher spot. The trade-off is that the load must be moved a greater distance. Everyday examples are stairs, escalators, ladders, and a ship's plank. A wedge is an inclined plane that moves and is used to increase force—either to separate something or to hold things together. With a wedge, the object or material remains in place while the wedge moves. A wedge can have a single sloping surface (like a door stop that holds a door tightly in place), or it can have two sloping surfaces or sides (like the wedge that splits a log in two). An axe or knife blade is a wedge, as is a chisel, plow, and even a nail. A screw can be considered yet another form of an inclined plane, since it can be thought of as one that is wrapped in a spiral around a cylinder or post. In everyday life, screws are used to hold things together and to lift other things. When it is turned, a screw converts rotary (circular) motion into a forward or backward motion. Every screw has two parts: a body or post around which the inclined plane is twisted, and the thread (the spiraled inclined plane itself). Every screw has a thread, and if you look very closely at it, you will see that the threads form a tiny "ramp"
that runs from the tip to the top. Like nails, screws are used to hold things together, while a drill bit is used to make holes. Other examples of screws are airplane and boat propellers. this article was very helpful! i used it for my homework and i am in 6 grade!!! it was very helpfull now i can use it in my enginering class thanks. Thanks for this information! It helped alot. One thing that I would like to know, is that what are the simple machines used for a waterwheel. Thanks again! Hey! Does anyone know what to make, that consists of 2 or more simple machines, for a science project? thiss stuff iss superr hardd :( 10th gradee workk ! im in the 8th grade and this stuff is easy pathfinder k-8 rocks! what is the other examples of machines?? This artile was very helpful. I had a project to do in science on simple machines. And this website had all the information I needed to do that project. I liked this article and I want to use it for my science fair project background research paper but my teacher told us that we have to cite every thing used and I was wondering how to cite this website APA style and if it was a print source or what. Very informative,plus it helped me in my home work and I'm in 6th grade! THis is a good website to use for all of your needs for simplae machines. I have a science Exam tomorrow! This website was a big help. Let's just hope I get a 'B'!